Ohaneze Ndigbo, the Pan-Igbo socio-cultural group, said it would resist any attempt to discredit Deputy President of the Senate, Ike Ekweremadu. 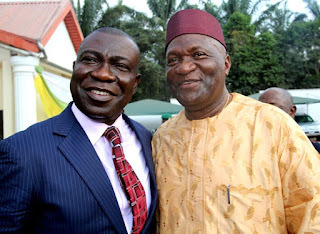 President-General of the group, Nnia Nwodo, in a statement on Thursday, in Enugu, said it was preposterous for the Federal Government to be carrying out unwarranted inquisition into Ekweremadu’s life. He said that the allegation that Ekweremadu, the highest ranking Igbo politician in the country, embezzled public funds without any prima facie case was inappropriate. Nwodo stated that the idea of asking the Senator to defend himself instead of his accusers showing how he fraudulently enriched himself, amounted to turning the law upside down. He observed that Ekweremadu was a revered Igbo son and had attracted a lot of development to his area without any previous accusation of embezzlement. The president-general queried the system of investigation where one was tried for simply belonging to a political party “and is exonerated of an offence he committed for belonging to a political party or being in government’’. He cited examples of former and serving military officers who had been let off the hook either through plea bargain or for just changing from one political party to another. He also said that a former governor of Enugu State whose property was under investigation was now dining with the Head of State after dumping his former party for the ruling party. Nwodo warned that the apex Igbo group would no longer fold it arms while Igbo sons were being systematically singled out for persecution in a country they had contributed so much to build. He observed that the cautionary statement by Ekweremadu had been and was still being echoed by many prominent Nigerians and wondered why his case would be different. He said that it was such selective justice and marginalization of Ndigbo that fueled agitations by their young ones for self-determination, adding that restructuring was a first step toward assuaging the situation.